Holy cow, it's Fall! Time to pull out the layers, put on the boots, wrap yourself in scarves & sip on some PSLs. Or not, in case you are somewhere like Nashville & the weather literally hasn't changed. Maybe by the time Thanksgiving rolls around there will be some of that much awaited chill! So here's to dressing like the weather it is, instead of the weather I wish it was... because nobody wants to see me sweating in leather & wool just yet! P.P.S. If you are looking for some unique & flattering sunglasses, might I recommend these wooden ones... the side arms are made of seriously stunning wood with exposed grain! The color combo in these shorts is so fabulous–I love this whole look! I can totally relate to the non-changing weather! It's not really the least bit cold here (except maybe in the mornings and evenings) so those cozy layers/leather jackets haven't quite surfaced yet, however I do love this outfit on you! Those shorts are adorable! Seriously great outfit! I feel you on the weather, but I'm finding it harder and harder to dress for the weather it is!! This is so chic! 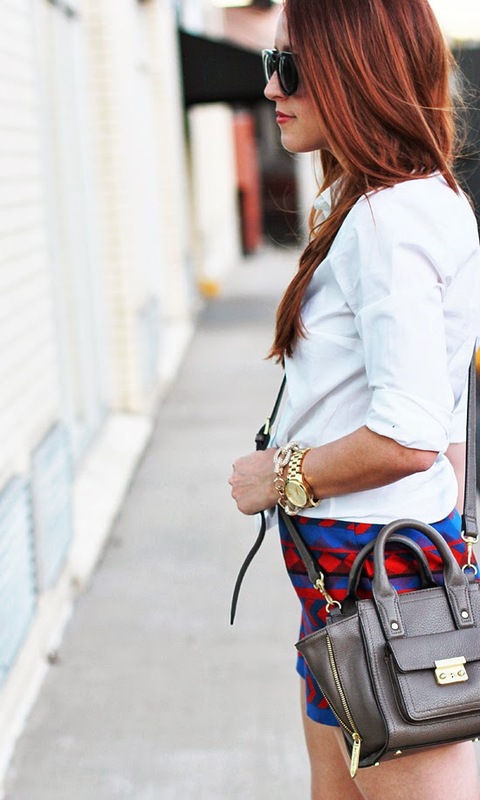 LOVE your patterned shorts and perfectly paired with the white button down! Okay, seriously, you are gorgeous. Loving your shorts and sunglasses! 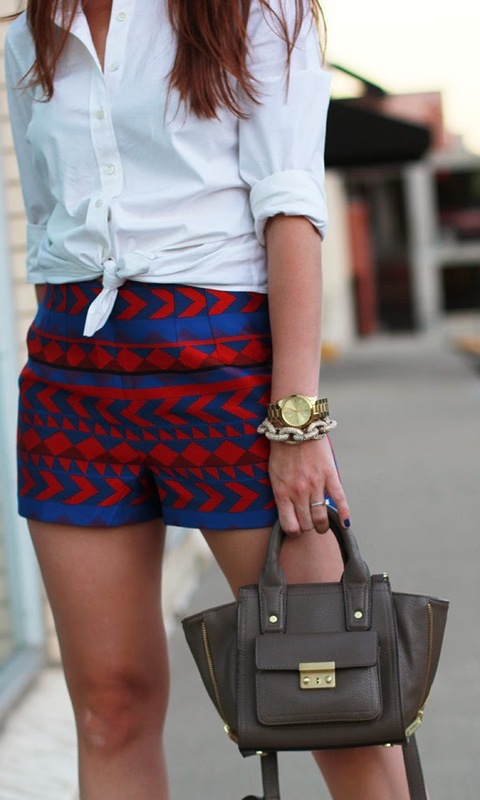 Love the print of your shorts! Love the outfit! It's too bad it hasn't gotten cool there yet. The mornings here are SO cold! Those shorts are adorable, love the print. And I'm totally jelly of that bag! I love that you're dressing for our lack of Fall weather instead of sweating in layers (like I was yesterday)! You look gorge and I love that mini satchel. Don't forget to enter my 2 year blogiversary giveaway for a chance to win a Baublebar Pave Links bracelet & sweet hanger necklace! Super cute shorts! And it seriously depends on the day/weather, I might be rocking shorts or boots! Haha I got ahead of myself a few weeks back and posted a full-on fall outfit complete with a sweatshirt. But, seeing as it was still 90 degrees, I nearly died taking my photos. Good for you for being NORMAL and abiding by the weather. Love the shorts and the bag! You look great! These shorts are amazing! I love how you worked them with a white blouse! Welcome! Thank you so much for stopping by & leaving such a sweet comment! You are seriously so adorable!! Love those shorts - can't believe they are from F21! Oh my gosh that purse is absolutely fantastic. I am soooo jealous!